In my opinion, Bytedance and Musical.ly are a natural fit. Combining the strengths of these two companies — innovative products, global reach, technological capabilities, and monetization model — could help create an unprecedented global digital media company. While the reality is that most Chinese tech companies are still locally focused, more and more Chinese companies are trying to go global by developing cross-border teams and acquiring assets. The globalization effort of Alibaba and Tencent are well-documented. Cheetah Mobile has produced many top-ranking utility apps outside of China. Xiaomi has become the №1 smartphone brand in India. Apus’ utility apps have experienced rapid growth worldwide. Garena (NYSE: SE), the highest-valued publicly traded Internet company in Southeast Asia, was founded a China-born entrepreneur and took inspirations from Tencent. Wish, the №2 shopping app in the US, was co-founded by China-born engineer who adapted a model partially inspired by Alibaba’s Taobao to the US and other markets. 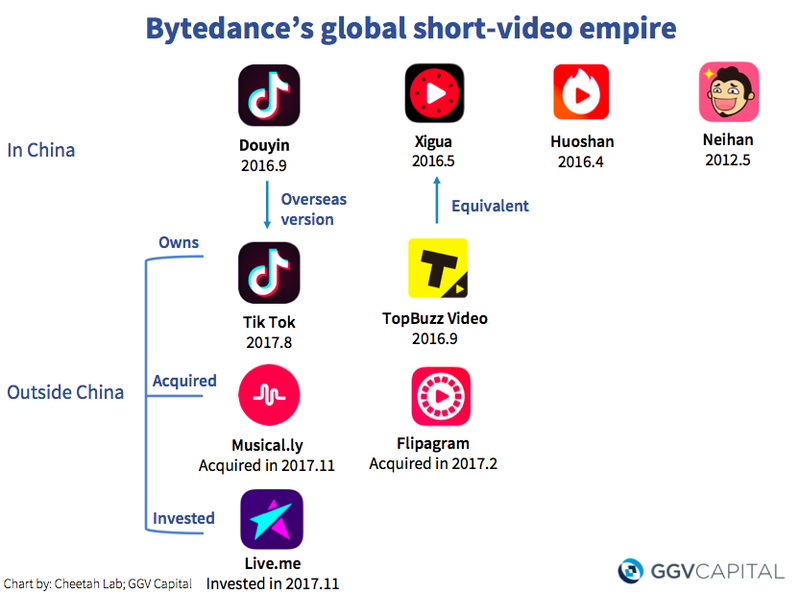 By using a mixed strategy of producing, acquiring, and investing in overseas products, Bytedance now has an impressive portfolio of global media platforms that are changing the way millions (soon-to-be billions) of people consume content. Hans Tung is a Managing Partner at GGV Capital. A five-time Forbes Midas Lister, he has been a US/China investor for more than a decade. He was among the first Silicon Valley VCs to move to China full time, betting on the rise of the Chinese consumer internet market with companies like Xiaomi where he was an early investor and board member. His portfolio includes 3 of the top 5 shopping apps in the App Store — Wish, Poshmark and OfferUp — with Ibotta growing fast at #12. Other companies in his geographically diverse portfolio include: Airbnb, Bowery Farming, Bustle, Dirty Lemon, Function of Beauty, Giphy, LimeBike, Lively, musical.ly, Peloton, Slack, Smartmi, Xiaohongshu (aka Red), Yamibuy, and more. Read his blog at hans.vc.